Text © Copyright October 2013, Thomas Nugent; licensed for re-use under a Creative Commons Licence. The humble underpass, especially the pedestrian variety, comes in many different shapes and sizes. The aim of this collection is to show the many wonderful artworks that are to be found in some of them. Artworks which often go un-noticed or which are afforded just a cursory glance on the way to or from the car park or railway station. Next time, stop and look - even better, stop, look and take a photo. Contributors please name the town where the underpass is located and also the name of the underpass if known. I expect that the photo descriptions will provide background details of the artworks, including the artist, but feel free to supplement that information here. These detailed ceramic tile murals depict some of the, mostly long gone, Clyde paddle steamers which used to call at the nearby Customhouse Quay and Princes Pier. Thankfully, one of them (PS Waverley) still does just that today. 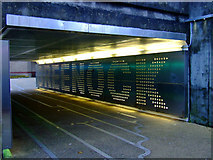 The underpass was created when Greenock town centre was redeveloped in the early 1970s. There are several of these tile mosaics in the pedestrian underpass from the Bullring car park to Wallace Square. Each depicts a Clyde Steamer from the heyday of 'doon the watter' travel on the nearby River Clyde. See NS2776 for some others. 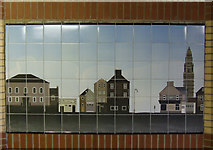 There are several of these tile mosaics in the pedestrian underpass from the Bullring car park to Wallace Square. Each depicts a Clyde Steamer from the heyday of 'doon the watter' travel on the nearby River Clyde. See [NS2776] for some others. The Waverley is still running and is the last ocean going paddle steamer in the world. See NS5665 : The Waverley Paddle Steamer for a recent photo. 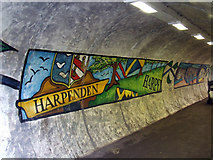 This underpass was also built during the early 1970s redevelopment and it also featured (past tense) ceramic tile murals which depicted the streetscape before it was demolished. The murals were replaced with more modern metallic and neon lighting artworks in 2011, but were reproduced in the nearby Oak Mall. 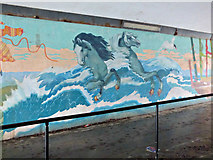 Geograph only has one photo of the original murals, which is shown below. Part of a large mosaic which shows how the area looked before the developers went crazy in the early 1970s. The following photos show the underpass as it is today. 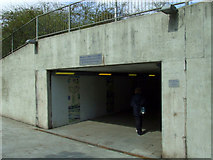 The underpass connects West Stewart Street and Kilblain Street to the Oak Mall. The floor resembles a circuit board, perhaps an acknowledgement of the town's electronics history? The lighting changes colours. 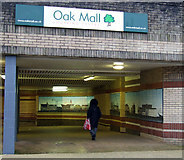 The underpass connects West Stewart Street and Kilblain Street to the Oak Mall. 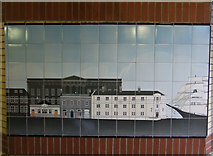 The ceramic wall tiles depicting local street scenes from the 1960s were removed and relocated nearby Link . The floor resembles a circuit board, perhaps an acknowledgement of the town's electronics history? 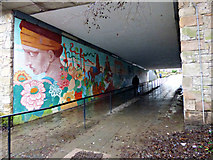 The underpass connects West Stewart Street and Kilblain Street to the Oak Mall. 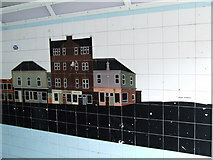 It is mid-renovation, the ceramic wall tiles depicting local street scenes from the 1960s will be returned soon. The floor resembles a circuit board, perhaps an acknowledgement of the town's electronics history? High Street can be seen in the distance. Connects West Stewart Street and the Oak Mall. 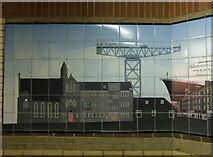 Another product of the early 1970s development, but the ceramic tile mural was only added in 2011 to replace the one in the West Stewart Street underpass (above). 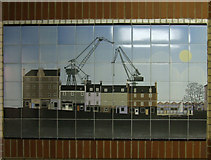 This reproduces the earlier streetscape of the West Stewart Street murals, with a few modern-day additions, including the Cunard liner QE2. Located between the Oak Mall and West Stewart Street. Located between the Oak Mall and West Stewart Street. It shows blue sky and a bright sun, so the artist probably didn't spend much time in Greenock. Located between the Oak Mall and West Stewart Street. The ship is the Queen Elizabeth 2 (QE2) which was fitted-out at Inchgreen dry dock in the town in 1967 and was an occasional visitor to Greenock in the her latter years of service as a cruise liner. The crane is at James Watt Dock and is one of the surviving 'Clyde Titans' Link . Located between the Oak Mall and West Stewart Street. The ship is the Queen Elizabeth 2 (QE2) which was fitted-out at Inchgreen dry dock in the town in 1967 and was an occasional visitor to Greenock in the her latter years of service as a cruise liner. Located between the Oak Mall and West Stewart Street. The building depicted on the right is the Beacon Arts Centre which is currently under construction at Customhouse Quay. 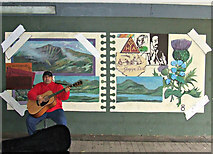 Some of the locally themed murals in the underpass at the railway bridge on Station Road. 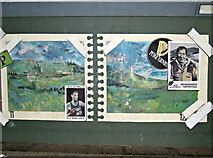 Some of the locally themed murals in the underpass at the railway bridge on Station Road. This one depicts the nearby agricultural research centre Link . 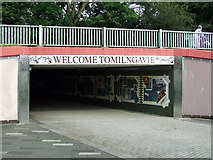 This underpass was revamped as part of the Glasgow Harbour riverside housing development which has transformed the site of Meadowside granary which was the largest in Europe. 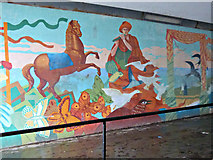 Four local schools (Thornwood Primary, St Peter's Primary, St Paul's (Whiteinch) Primary and Dowanhill Primary) participated in the project to decorate the underpass with ceramic tiles depicting local scenes, under the guidance of local artist Deborah Campbell. The first photo below shows the entrance to the underpass which passes underneath the A814 Clydeside Expressway. The rest show the twenty tiled panels, each of which consists of ten individual ceramic tiles. 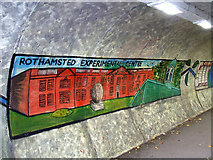 One of the local landmark buildings depicted in the underpass. 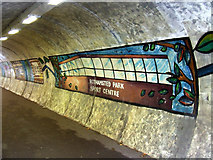 One of the local landmarks depicted in the underpass. One of the two descriptive tile panels. Possibly the Tall Ship Glenlee in full sail NS5565 : The Tall Ship. Possibly the Glasgow Harbour apartments NS5566 : Glasgow Harbour. Possibly one of the Glasgow Harbour apartment blocks NS5566 : Glasgow Harbour. A crane by the Clyde. Possibly Trinity College NS5766 : West End towers. The Finnieston Crane NS5765 : The Finnieston Crane. Possibly the Glasgow Tower at the Science Centre NS5665 : The Glasgow Tower. The Armadillo NS5665 : The Armadillo. The old pumphouse NS5665 : The Pumphouse. Possibly the Govan Angel building NS5764 : The Angel Building. This one looks very like like The Armadillo NS5665 : Armadillo or shark?. A pair of cranes by the Clyde. A local building, possibly a factory or warehouse. Possibly the Meadowside granary which once stood near this spot. Ships on the Clyde, possibly PS Waverley in the foreground. 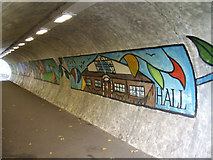 This underpass links the town centre and the railway station and is often used by hikers starting or finishing the West Highland Way. It depicts famous local people and historic scenes and is in the form of a spiral bound photo album, with photos taped to the pages. 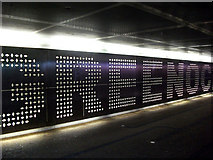 The entrance at the railway station side of the underpass. The underpass just north of the railway station. The entrance at the Gavin's Mill side of the underpass.